When will be Christmas Kitchen next episode air date? Is Christmas Kitchen renewed or cancelled? Where to countdown Christmas Kitchen air dates? Is Christmas Kitchen worth watching? In the lead up to the festive season Christmas Kitchen will broadcast every weekday morning on BBC One presented by Matt Tebbutt and Andi Oliver. 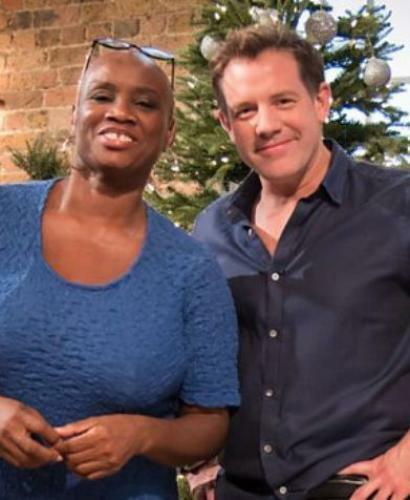 Festive food programme with hosts Matt Tebbutt and Andi Oliver. They are joined by Call the Midwife's Helen George, chef Thomasina Miers and British baker Edd Kimber. Matt and Andi also delve into the BBC Christmas food archive with clips from the Hairy Bikers, Rick Stein and Keith Floyd. Wine expert Olly Smith picks the wines to go with the studio dishes and introduces some party season cocktails. Andi and Matt are joined by Aled Jones; Theo Randall cooks up a celebration dish, Great British baker Jane Beedle serves up a delicious Yuletide gift, and the show will be delving into the festive cooking archives of Nigel Slater and the Two Fat Ladies. Andi and Matt are joined by Father Brown's Mark Williams, Vivek Singh cooks up a celebration dish, Great British baker Chetna Makan servies up a delicious Yuletide gift, and the show will delve into the festive cooking archives of Nigella and the Two Fat Ladies. Festive food programme with hosts Matt Tebbutt and Andi Oliver. They are joined by a celebrity guest, chef Sabrina Ghayour and Great British baker Richard Burr. Matt and Andi also delve into the BBC Christmas food archive with clips from the Hairy Bikers, Lorraine Pascale and Fanny Cradock. Wine expert Jane Parkinson picks the wines to go with the studio dishes and introduces some party season cocktails. Christmas Kitchen next episode air date provides TVMaze for you. EpisoDate.com is your TV show guide to Countdown Christmas Kitchen Episode Air Dates and to stay in touch with Christmas Kitchen next episode Air Date and your others favorite TV Shows. Add the shows you like to a "Watchlist" and let the site take it from there.